Pagoda flower, Clerodendrum paniculatum L. AKA: pangil-pangil or panggil-panggil (Malay). 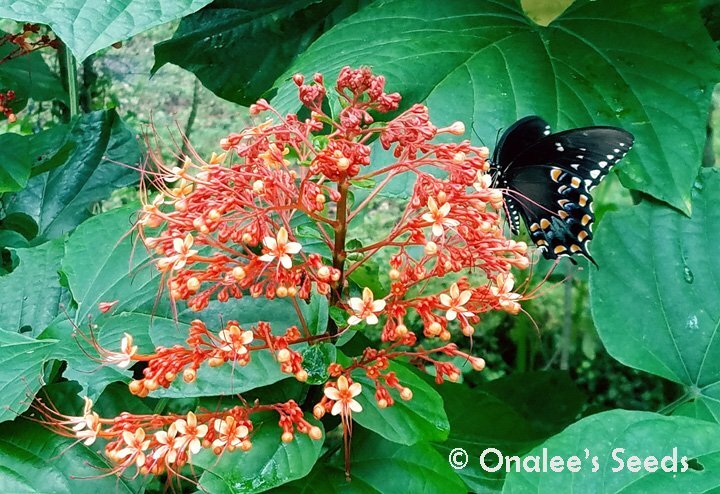 A beautiful and fast growing 3' to 5' shrub with pagoda-shaped orange flowers which the butterflies absolutely LOVE. Tropical and showy, hardy to zone 8. Can be container grown and brought in for winter in colder zones. You are purchasing 2 rooted plants 8-12 inches high. They will be shipped bare-root and most of the leaves will be trimmed back for shipping. 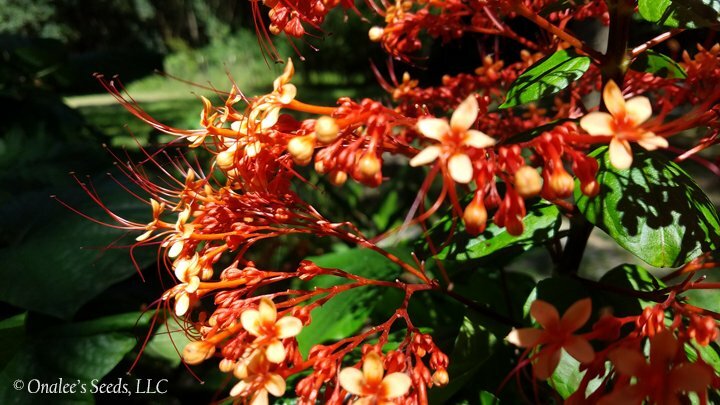 Pagoda flower, Clerodendrum paniculatum L. is also known as pangil-pangil or panggil-panggil (Malay). 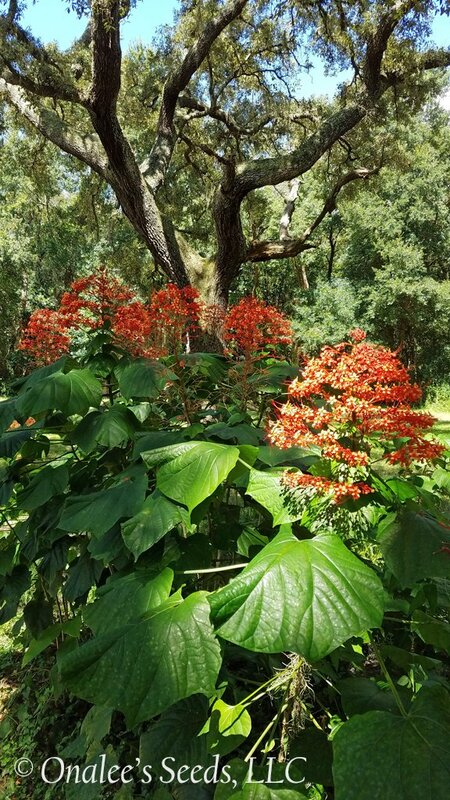 A beautiful and fast growing, 3" to 5" shrub that gets showing, groups of orange flowers which, together form a shape like a Pagoda. The butterflies absolutely LOVE these flowers and they look amazing growing in groups. These spread with underground runners, but I've found they spread less rapidly than other Clerodendrum, and I've not had a problem with them trying to 'take over" flower beds. Growing zones are 8 to 11 - they will be killed by frost but will rapidly grow back once the weather warms and will bloom by late spring and continue throughout the summer. A very easy maintenance-free plant that requires very little water once established. Prefers full or partial shade but can take more sun with more water. Pagoda flower is native to India, Sri Lanka, Malaysia and much of southeastern Asia. 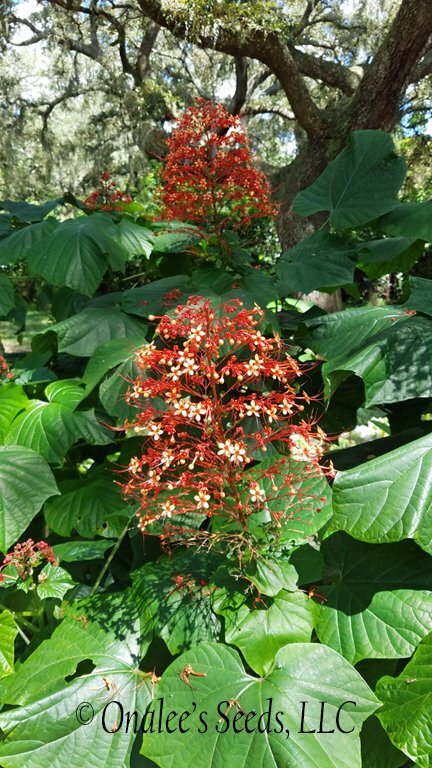 It is widely cultivated in tropical gardens throughout the world. These will be shipped bareroot to save on shipping I also trim ALL of the large leaves off the plants for shipping these will re-bud once the plant is established in it's new home but keeps these leaves from draining nutrients from the root system.